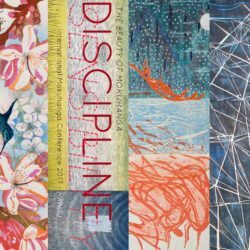 The Product Showcase is an excellent opportunity for introducing mokuhanga related products to an audience of artists with a strong interest in tools and materials. Many of them are teachers who will share this information with their students, reaching many more. 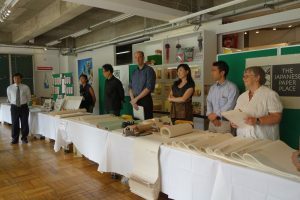 Mokuhanga tool and materials makers, and papermakers are invited to participate. This includes wood carving tools, water-based pigments, brushes, barens and other crafts that support mokuhanga printmaking. Because the number of tables is limited they will be allocated on a first-come first-served basis. There will be an additional charge of $50 US for suppliers who wish to participate in the Opening or Closing Receptions. These receptions offer an opportunity to get to know conference participants for future business arrangements. Those who wish to participate must submit a Product Showcase Registration Form along with the Conference Registration. Participants must bring their products in person. The Conference office is not able to accept any products delivered by post or courier. Only products related to mokuhanga printmaking can be introduced. Participants must not leave their tables during the fair. If an absence is unavoidable, a substitute must be arranged. Conference staff is not available to assist at tables. Selling at the venue is not permitted. However, participants can negotiate prices and delivery methods with potential buyers. The Conference Executive Committee can not assume responsibility for such exchanges. INSURANCE:The Conference Executive Committee cannot assume responsibility for loss or damage to any submitted products for any reason, before, during or after the exhibition. Insurance protection is the responsibility of each artist. Bringing any products to this event shall imply agreement on the part of the artist to all conditions set forth in the prospectus. University of Hawaii at Manoa, Dept. of Arts & Art History/Art Building Gallery 3Fl.